Bharatiya Janata Party chief Amit Shah on Monday tore into the Congress over its “failure” to tackle unemployment and other problems and its criticism of the GST, saying it was not a ‘Gabbar Singh Tax’ but the revenues go to pay for ‘one rank, one pension’ and subsidises the poor. In his maiden address in the Rajya Sabha, he also asked whether the Congress was inciting the people not to pay taxes, as he listed out the National Democratic Alliance government’s achievements on various fronts. 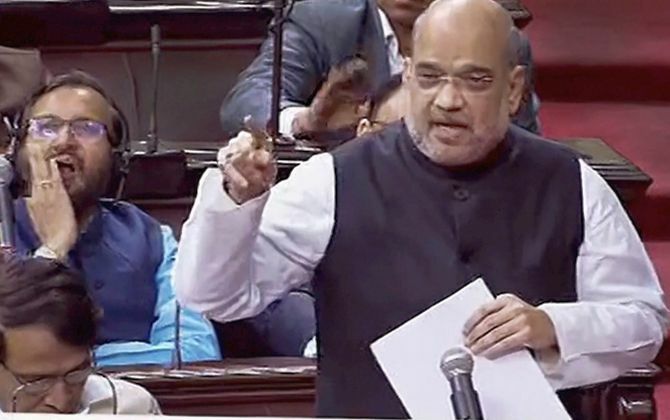 Initiating the debate on the Motion of Thanks for the President’s address, Shah took on senior Congress leader P Chidambaram for his ‘pakoda’ jibe and said it was better to sell pakodas than being unemployed. In his almost 90-minute speech, Shah termed GST as a big reform which “realised the dream of ‘One Country, One Tax’ and castigated the politics over the new indirect tax regime. Referring to Congress president Rahul Gandhi’s comment terming GST as Gabbar Singh Tax, Shah pointed out that Gabbar Singh was a dacoit in the Bollywood blockbuster Sholay. “Is dacoity taking place here? Is legally claiming taxes from people a dacoity? Is this the understanding of people? And where does this Gabbar Singh Tax/GST go? It goes in the bank account of a jawan for giving One Rank, One Pension, it goes in the bank account of widows of martyrs. It goes towards giving the poor women (clean cooking fuel) Ujjwala Yojana,” he said and asked whether inciting people not to pay taxes was a symbol good politics. “Where are we taking the country? We will all have to think, this is not just a matter of one party. Today we are in power, tomorrow you may come. Yes, you can come. Our mindset is not such that we will remain in power till eternity. “This is democracy, the citizens can vote anyone to power. You have also remained in power for 55 years. The country does not run like this. On certain issues, one has to rise above party politics for the country to run,” Shah said while responding to opposition remarks. He sought to dismiss the notion that BJP-ruled states had earlier opposed GST when the idea was floated by Congress-led United Progressive Alliance government, saying there was lack of trust as the Congress did not fulfil its promise of compensating states. “It is said that the BJP (state) governments opposed the GST when the Congress government was in power. This is not true. The BJP never opposed the GST but only opposed its ways. “The state governments did not trust because the UPA government brought this tax reform, reduced CST from 4 per cent to 2 per cent, you (UPA) had to compensate states for the losses incurred by them. But you did not fulfil your promise. The BJP-led NDA Government compensated Rs 37,000 crore to states,” Shah said, adding that the states were not scared but worried over the losses on account of GST’s rollout. Observing that GST was being projected as if small businesses will be shut, he assured that nothing of the sort will happen and said the small businesses and MSMEs will become stronger. The BJP president agreed that there are teething problems in the GST implementation due to the scale of the reform, but observed that the government was sensitive and said over 30 procedural changes were effected through the GST Council meetings. The prices of 400 items were reduced in the 23 Council meetings whereas 150 items made tax free. He dared the Opposition to make public the minutes of the GST Council meetings, saying it was speaking a different language in the Parliament when Ministers of states it ruled were supporting it. “One language in the GST Council meeting, another in the Parliament and a different language in the meetings. What kind of the politics is this? Shall we publish the minutes of the GST Council meetings and make them public,” Shah said. The BJP president also pitched for simultaneous assembly and Lok Sabha elections, besides touching upon a host of measures taken by the government -- ranging from power supply, toilets, gas, employment and health facilities to the people. He said in 2013, the situation in the country was such that the future was uncertain, women felt unsafe and the morale of jawans guarding the border could not display their valour due to the government’s indecisiveness. A series of scams worth Rs 12 lakh crore was raising big questions in the citizen’s minds and over policy paralysis. On the issue of unemployment, he said the problem was persisting even after 55 years of Congress rule but so intense that 8 years (of NDA rule) were not enough to resolve it. Shah referred to the initiatives taken by the government in this regard including Skill India, Stand Up India, Start Up India and MUDRA schemes. While appreciating the nationalisation of banks unleashed by former Prime Minister Indira Gandhi, Shah said the doors of banks were not opened for the poor, which has been done now. Referring to the Ayushman Bharat scheme announced in the Budget to provide insurace cover of Rs 5 lakh to 40-50 crore people, the BJP President said no government had the courage till now to introduce a scheme of this scale, therefore the scheme has been christened ‘NaMo Healthcare’ by the people. “This government has a principle. We do not take decisions that people like. We have seen governments which took decisions for vote bank (politics) to suit people’s likes but this government takes decisions that are good for the people, not decisions that they may like,” Shah said. Referring to the cowardly Uri attack by Pak-sponsored terrorists when 12 jawans were burnt alive while sleeping, he said the prime minister displayed exemplary political will and the attack was avenged within 10 days through a surgical strike in Pakistan occupied Kashmir. Shah appealed to the Opposition Congress to support the bill to give constitutional status to the National Commission for Backward Classes for its smooth passage in both Houses of Parliament, saying there was no politics involved. Referring to the Triple Talaq legislation, Shah said Muslim women were battling for their rights in courts since last many years. He said in the Shah Bano case then Congress government framed a law to oppose the court’s verdict and the party was again opposing the Triple Talaq legislation, although the manner of opposing may be different. “When the PM brings a legislation to protect the rights of Muslim women, the Bill was stalled in the Rajya Sabha,” the BJP chief said. Shah said the government was being run in a transparent manner and in the last 3.5 years, even the opposition has not been able to accuse the government of any scam. He said dynastic politics, casteism and appeasement were three problems plaguing the country. Whatever happened to job creation?